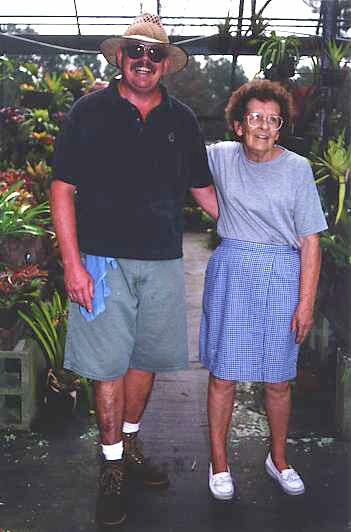 Mother became interested in collecting bromeliads at the age of about 50. My brother, father and I had gone to play golf leaving her alone to work in the yard. She decided that the ingrates, AKA her family, could all go to hell and the rest of her life was going to be her own. She became fascinated with the beauty and hearty spirit of survival of the species and the rest is history. Bromeliads became her passion and her reason for living. Because they make more oxygen than any other plant, I attribute her love of bromeliads to her longevity. Most breast cancer survivors rarely live more than 10 or 15 years past the first diagnosis and treatment. Mother made it 37 years. If she had avoided chemotherapy, it would have been longer. Hindsight is 20-20. Mother's first collecting trip was to Jamaica; the last one was to Honduras shortly after her last mastectomy in 1983. She always wanted to go to Brazil and to Australia, but it was not to be. Geoff became interested in the plants after moving back to the area in 1976. Mother took him on as a partner, and together they built the business. The first greenhouse was a cypress, flat roof monstrosity that became a hazard after about 8 years. Equipped with a home equity loan, they built the structures that were to outlive them. Mother was the sixth of seven children born to Arthur and Olive Stapleton. She was born August 20, 1918 in Minneapolis. Shortly after her birth the family moved to Ladysmith, Wisconsin, where she was raised. She married a man by the name of Harold Carlson and they had my sister Judy. Harold moved to Alaska to work on the pipeline. He was to send money home and find a place for all of them to live. He never did send any money. Mother had to move to Alaska to divorce him there. She went to work for the Department of War in Alaska to support her and my sister while they waited for the divorce to be final. On New Year's eve 1944, my father and his friend were lost and they crashed the party my mother was throwing. They dated, and they were married less than a year later. They moved to Atlanta where she worked writing a column for the newspaper, and he worked for an auditing firm. They later moved to Gainesville so he could finish his CPA stuff. Mother fell in love with Florida, and so they stayed. She always had a green thumb. The glass greenhouse on the property was purchased and erected in 1963 in the back yard of a small house in Pine Hills. When we moved to the country in 1965, it came or she wouldn't. She used to raise Easter lilies and mums and sell them to the local supermarkets; this continued until the discovery of the beloved Bromeliad. We tried roses and fruit trees, but my 4-H project (cow) ate most of them. Cows are incredibly stupid creatures. Geoffrey Charles Johnson was born in Orlando on November 19, 1952. He went to school at Florida Atlantic University where he obtained a degree in Microbiology. He came home to regroup and to look for work in the Orlando area. He became interested in the bromeliads and the rest is history. Geoffrey went on several collecting trips as well. Geoff loved the plants so much that he hated to sell them to amateurs. He hated to sell them period. I remember walking through the greenhouses with him when I'd stop by. I'd ask him for the tour and he'd show me the latest prize, project, and plant that needed nursing. Geoffrey fell in love with each plant as if it were one of his children. Geoffrey had met and fallen in love with another bromeliad fancier whom he planned to settle down with. They were going to move the business to the Ft. Pierce or Melbourne area and live happily ever after. The story isn't over yet. This same person may reopen the business and so the legacy of Pineapple Place may continue one day.